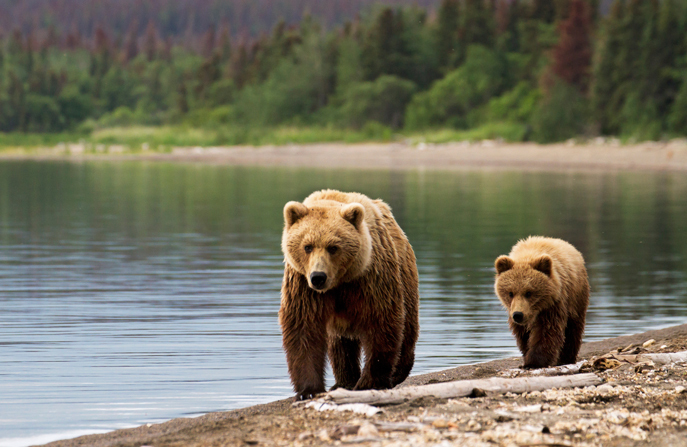 From forests to tundra, oceans to desert-like badlands, and mountains to plains, Canada is abundant in a rich variety of habitats and wildlife species. Canada’s biodiversity (i.e., biological diversity) is important to its culture, economy, tourism, agriculture, and history to name just a few areas. “Biodiversity encompasses all living species on earth and their relationships to each other. This includes the differences in genes, species and ecosystems” (biodivcanada). 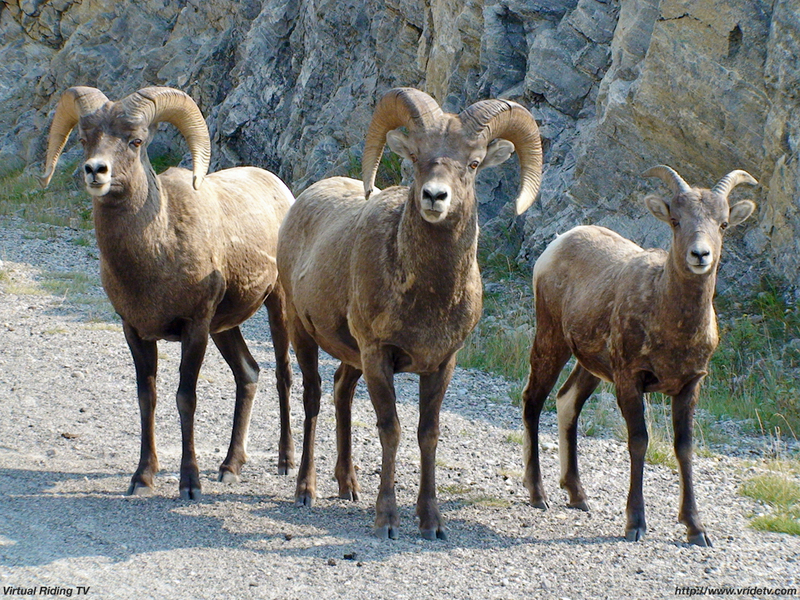 People can expect to come across wildlife almost anywhere they travel throughout the country. Given their importance and abundance, it is no wonder that Canadian wildlife species are honoured in various ways such as is seen on most Canadian coins. Wildlife species are an integral component to biodiversity and impacts on wildlife can have significant effects on local environments. To ensure continued habitat and wildlife integrity, federal and provincial laws protect many plant and animal species, particularly those designated as a species at risk. Furthermore, Canada is currently developing its national biodiversity goals for 2020 (see biodivcanada website), which coincides with the United Nations Decade on Biodiversity 2011-2020. Canada possesses a number of remarkable geographic features that contribute to its extensive biodiversity. Situated in North America, Canada is the world’s second largest country and is one of only a few countries that contain large areas of intact wilderness. There are more lakes in Canada than in any other country in the world. Furthermore, Canada contains the greatest source of global freshwater stores. For instance, the Great Lakes Basin in southern Ontario houses 18% of the world’s freshwater. Wetlands cover approximately 14% of Canada’s land area. Wetlands are areas of soil that are submerged or saturated by water, such as marshes or swamps. The combination of soil, water, and the unique plants which grow in wetland environments create nutrient-rich ecosystems for many species to feed upon. These areas are important habitats for a diverse number of Canadian wildlife species and are protected by the Government of Canada as well as international conventions. Canada is comprised of 15 terrestrial (land) ecozones and five marine (water) ecozones. The Canadian Boreal Forest, which stretches across from western to eastern Canada, is the largest ecozone in the country covering 58% of the land. It houses numerous wetlands although the majority of the system comprises coniferous forests. Many wildlife species live within, and rely upon, the forest. 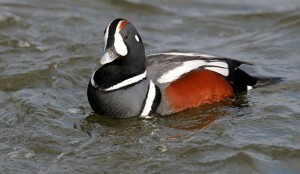 For example, every year over 26 million ducks and other water fowl use Canada’s Boreal Forest for breeding. The diverse geography of Canada supports thousands of animal species found across the country. Along the coasts, one can expect to see killer whales, sea turtles, seals, salmon, shellfish, and over 7,000 other ocean dwellers (The Canadian Biodiversity Website). Among the nearly 300 species of wildlife found on land, one may come across bears, moose, deer, wolves, beavers, or racoons. Canada is also home to over 400 species of birds including the Canada goose, songbirds such as various sparrows, and numerous birds that spend their time along Canada’s shores including gulls and sandpipers. Freshwater lakes and rivers are home to large numbers of aquatic species including turtles, snakes, snails, and frogs as well as nearly 200 species of fish such as trout and perch. In addition to the above, thousands of other types of species live and thrive across Canada. Taken together, it is clear that many ecozones and a wide range of wildlife and other species help make Canada a unique and diverse place to live from coast to coast. 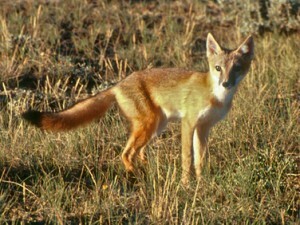 The Swift Fox is a threatened species and has been extirpated from its historical region in southern Alberta. A large number of species around the world are threatened in some manner, that is, the species is likely to become endangered and possibly extinct or extirpated at some point in the future. Species can be threatened due to a variety of reasons including human activity, climate changes, disease, or a rise in predators. There are a number of different systems around the world used to classify the level of endangerment for a species. For instance, the International Union for Conservation of Nature (IUCN), the oldest and largest global organization for the environment, uses a classification system for species endangerment that many countries follow or base their systems upon. 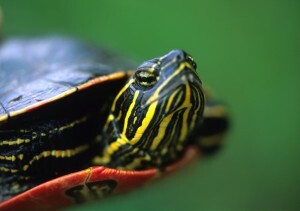 The Western Painted turtle is endangered along Canada’s Pacific Coast. Extinct (X): Wildlife species that no longer exists. Extirpated (XT): Wildlife species that no longer exists in the wild in Canada, but exists elsewhere. Endangered (E): Wildlife species facing imminent extirpation or extinction. Threatened (T): Wildlife species that is likely to become endangered if nothing is done to reverse the factors leading to its extirpation or extinction. Special Concern (SC): Wildlife species that may become threatened or endangered because of a combination of biological characteristics and identified threats. Data Deficient (DD): A category that applies when the available information is insufficient (a) to resolve a wildlife species’ eligibility for assessment or (b) to permit an assessment of the wildlife species’ risk of extinction. Not At Risk (NAR): Wildlife species that has been evaluated and found to be not at risk of extinction given the current circumstances. Among the various types of environmental legislation that govern the protection of wildlife, the Species at Risk Act (SARA) governs Canada’s overall approach to the protection and recovery of threatened species (Species at Risk Act, Environment Canada website). The Act applies to federal lands (such as Canada’s oceans and waterways, national parks, military training areas, and First Nations reserves), all aquatic species, and migratory birds listed under SARA that are on federal, provincial, public or private lands. Approximately 345 species of Canadian plants and animals have been designated as a “species at risk”. Unsurprisingly, human activity, particularly as it contributes to habitat loss, is the primary cause of endangerment to Canadian species. In an effort to better track the issue, the Government has created a public registry listing nearly 1,000 Canadian species and their corresponding level of risk designation. Users of the registry can search for species based on a number of different criteria including region, level of endangerment, and scientific name among other criteria. Along with the Government of Canada, each province and territory has legislation and/or regulations in place that pertain to species at risk within their regions. Transportation systems and particularly roads can have an effect on a wide range of animal species and their habitats. Increasingly, researchers and practitioners (e.g., road engineers, transportation planners, or law enforcement) are discovering and implementing new ways to lessen the impact of roads on biodiversity and especially efforts to reduce collisions with wildlife. Nonetheless, there are some wildlife species that experience the impact of roads to a greater extent than other species. Below you will find educational handouts on a selection of animals most frequently affected by road systems. These can be easily downloaded, emailed, or printed for your use. Smaller and portable reference cards also have been developed for some wildlife that can be easily stored in glove compartment boxes for road trips. Other sources of wildlife information. The following sources provide searchable information and/or factsheets on various Canadian species. biodivcanada. Draft 2020 Biodiversity Goals and Targets for Canada. (Accessed November 20, 2014.). Canadian Boreal Initiative. About Canada’s boreal. (Accessed November 20, 2014.). Committee on the Status of Endangered Wildlife in Canada (COSEWIC). COSEWIC assessment process, categories and guidelines. (Accessed November 20, 2014.). Environment Canada. Protected Areas. (Accessed November 21, 2014.). Environment Canada. Species at risk. (Accessed November 19, 2014.). Government of Canada, Species at Risk Public Registry. Welcome to the species at risk public registry. (Accessed November 20, 2014.). Natural Resources Canada. Defining the boreal. (Accessed November 21, 2014.). Statistics Canada. Section 2: Canada’s water supply—stocks and flows. (Accessed November 19, 2014.). The Canadian Biodiversity Website. Canada’s species. (Accessed November 21, 2014.). The Canadian Biodiversity Website. Amphibians and reptiles. (Accessed November 21, 2014.). The Canadian Biodiversity Website. Fish. (Accessed November 21, 2014. ).